These Clara Ole' Sauces arrived at my doorstep recently and was very excited to whip some pasta except that we don't have any in the pantry- boo hoo hoo! So it took me a couple of days more before I was able to use it. 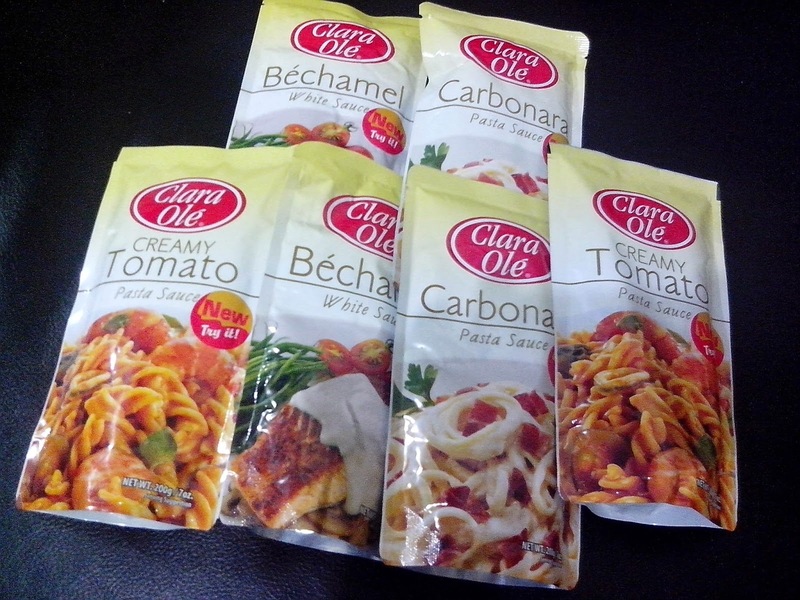 I've tried other Clara Ole' products such as the Original Barbeque Marinade (our fave), Three-Cheese Pasta Sauce (our fave), Italian-Style Pasta Sauce, Chunky Tomato Pasta Sauce, Kung Pao Sauce, Cheesy Pesto Sauce (our fave), etc. so I know that these packs are filled with yummy goodness. The first one I used was the Bechamel Sauce. I opted to use shrimp since I just bought some. Also, because my daughter warned me not to cook fish fillet for her lunch "baon" in school. Haha. She got "sawa" eating fish fillet when SY 2013-2014 was about to end because I was too impatient for school to end that I just told her to buy lunch from the canteen near the school. As with other canteen's, food choices are mostly- adobo, tocino, fish fillet, sauteed vegetables. She's not much of a meat eater so she always end up having fish fillet for lunch. Here's the recipe I created using Clara Ole' Bechamel Sauce. What I like about the sauce was that I can readily use it even without adding herbs and spices. Its already prepared as it is so all you need is the meat or fish or vegetables. It can also be used in making lasagna (as pointed out by my daughter who loves lasagna) and other dishes that makes use of bechamel sauce. Thumbs up! Tried using the Carbonara Sauce also and here's the carbonara recipe that I made. Another winner here! No need to "timpla" the sauce. I just added bacon, bell pepper and mushrooms. Yummy!!! The sauces are a goldmine for moms like me who values time but still want to prepare delicious and healthy meals for the family.